I got this item for free on Amazon Vine. When I saw it, I thought it would be perfect for my eight-year-old daughter. She’s developed a real affinity for super heroes, and I particularly want her to realize there are plenty of strong, intelligent, respectable female super heroes as well. As is my habit when I get unknown books for my children, I preview them first. It became very obvious very quickly that this is not intended for an eight-year-old. 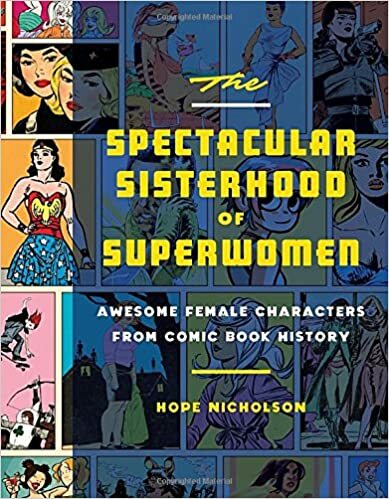 This is not so much a reference book as it is a historical overview of female comic book characters going as far back as the 1930s. The book is divided into chapters by decade and presents anywhere from five to twelve characters per chapter. The author tries to choose culturally important characters or characters that influenced the industry, and is sure to include an “Icon Of the Decade” at the end of every chapter. The characters are incredibly diverse and from a wide range of publishers. These publishers sometimes include those of the “adult” variety, and so some of the illustrations may be a little more suited for an older audience. Like I said, I assumed this book was meant for children, and that’s my mistake. There is a long, sordid history of objectification and exploitation of female characters in comic books, and this book does not shy away from that fact. Nicholson has written a well-researched historical guide of influential female characters throughout the medium’s evolution. She also provides nice insight and a funny sense of humor. As my daughter ages, I will be more than happy to let her look through this book in order to understand the journey of the female comic book character as well as the growth of the industry. In regards to females, comic books have come a long, long way, though there is still room to grow. I am heartened that the final chapter, the 2010s, showcase some outstanding characters who are self-reliant, intelligent, strong, full of story, and largely free of being sexualized. As a father of two little girls, I pray this is indicative of a change in societal views as well.